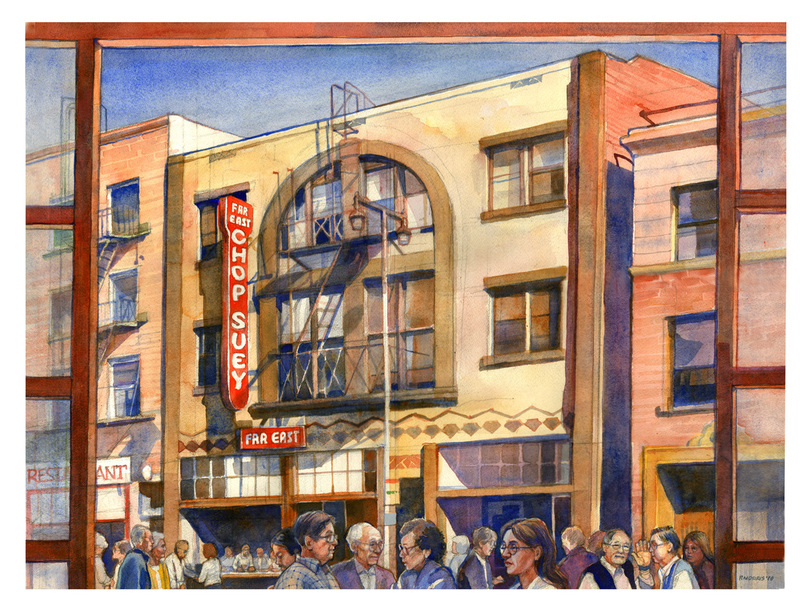 Pete did this painting of the Far East Cafe in Little Tokyo to capture the sense of community he feels at the church he attends --First Presbyterian Church, Altadena—a church that in 2013 celebrated 100 years of ministry to people of Japanese ancestry. Far East is well-known and remembered fondly in the Japanese American community as the place where many family get-togethers and other significant gatherings of the community took place—birthday parties, wedding celebrations, memorial service receptions, office luncheons, business meetings, and social gatherings. So to make the connection of this historic site to his church, Pete painted in the foreground images of people from his church whom many from his church would easily recognize. And of course, the one person who stands out in the crowd—the only one looking straight at the viewer and distinguishing himself with a wave of his hand—is none other than Iwa President, Stan Inouye. And if you don't look closely you're bound to miss one other significant person in the background. He's sitting at a window looking out at the people on the street. He doesn't bring attention to himself, but he's there. You can see who he is in the slideshow on the right. In the slideshow above, larger images of the church people in the foreground are shown, along with their names. The slideshow starts at the bottom lefthand side and moves to the right. It is hoped that these images will provide the sense that Pete had of real people who form a vibrant and living community—Pete's church family. Although a few have already passed on, they are still very much a part of what makes this community thrive and grow, as it has for 100 years. Click on the upper left hand corner of the picture, or on the thumbnail, to pause the slideshow so that you can read the caption. Click on any thumbnail to jump to that picture. Click on the upper left hand corner again to allow the slideshow to continue on its own. Pete Morris, an Iwa Associate and long-time supporter of Iwa, recently had a documentary video made of him and his art project of sketching the people he sees when he rides on the Metro to work. Please take a look at the video on the right. It even shows him in the pulpit at the church he attends—First Presbyterian Church, Altadena—which is also the church where Iwa's President, Stan Inouye, is a member and Elder, and where Iwa's office is located. 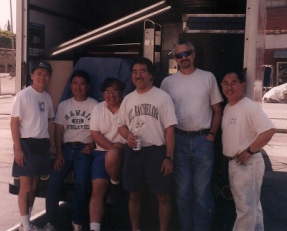 In the picture above, Pete is the tall one with sunglasses, posing with the crew that moved Iwa's office from Monrovia to Glendale in 1997. Stan is next to him on the right. Pete has discovered his time on the Metro to be spiritually invigorating. 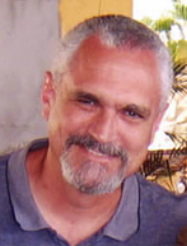 As a result of observing and drawing fellow passengers on the train, Pete has come to appreciate the uniqueness of each individual person and be overwhelmed by how big God must be to know the thoughts and intents of each person's heart, grieve over what each is missing without him in their lives, and yet continually reach out to each of them, knowing who they could become if they would but grasp his loving outreached hand. To the right are some of his recent sketches of people he's seen on the Metro. You may notice that he creatively included images and/or words that captured some of his thoughts about the people and the scene that he was observing.